Philadelphia 76ers guard Ben Simmons (25) moves to the basket against the Los Angeles Lakers during the first half at Staples Center. The NBA's tampering policy is one that is, to put it lightly, selectively enforced. Look at how the league operates and you'll come to that conclusion rather quickly — LeBron James' decision to sign with the Los Angeles Lakers was an open secret for months, and if you think that was locked down in the opening days of free agency without a lot of behind-the-scenes work, you're kidding yourself. Since moving into an executive role with the Lakers, Magic Johnson has forced the NBA to rethink how they police this issue. On Sunday, an off-hand comment he made about Sixers star Ben Simmons caught a lot of people by surprise, including front office members in Philadelphia and Los Angeles. This set off a chain reaction that led to the league looking into this incident, with Elton Brand issuing a statement to ESPN's Adrian Wojnarowski for his views on the matter. "I have a great relationship with Ben and Rich [Paul] and we expect him to be a Sixers for a long time," Brand said. "I had brief dialogue with Rob Pelinka who I've known for a long time, but nothing is planned. Our collective focus is on making a postseason push. Again, we're not sweating this, end of story." Per discussions with team personnel and people around the league, Simmons initiated conversations months back expressing his interest in picking the brains of some of the league's great players from recent history. Names on the list included (but were not limited to) Julius Erving, Kobe Bryant, Tim Duncan, Allen Iverson, and yes, Magic Johnson, according to sources. For clarity's sake, this was not about workouts, as Johnson alluded to during his Sunday conversation with the media. "It wasn't like Ben was going to be shooting from the elbow with Magic on the floor," a league source told PhillyVoice. Simmons' goal was primarily to have a dialogue with great players to extract wisdom from those who came before him. At 22 years old, Simmons is aware that the path to being an NBA champion and multiple-time All-NBA player will be navigated easier with helpful advice from those who have walked it already. 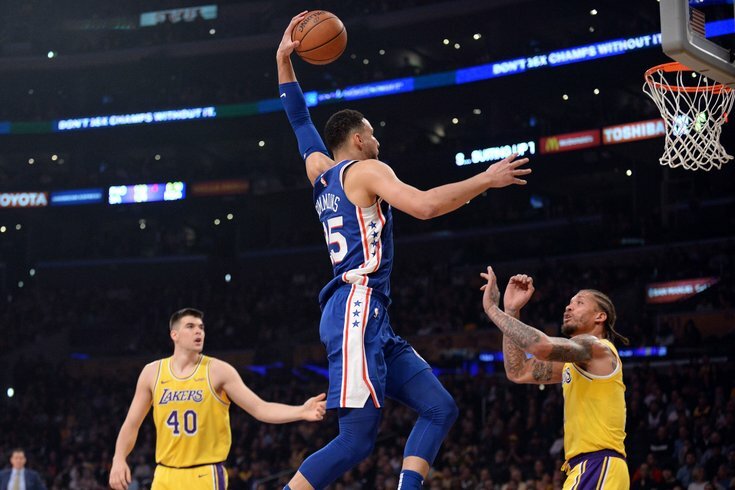 Given the stylistic similarities between Simmons and Magic, which Simmons also noted following the win over the Lakers Sunday, Johnson's name appearing on this list is not a huge shocker. There was a dialogue between staffers in Philadelphia and Los Angeles last month, which eventually resulted in discussions between Brand and Lakers executive Rob Pelinka. Most of the parties involved considered this issue shelved at that time, with no plans for the two to meet up and more pressing issues to focus on for both parties heading into the season's final stretch. There were different reactions to Johnson's recent monologue depending on who you asked. The overwhelming consensus was bewilderment that Johnson would say anything about it in the first place; most people I talked to in Philadelphia felt comfortable with the previous discussions between the organizations and were just confused at why Johnson would put himself under the limelight after a very public saga involving Anthony Davis. Others were not as a charitable. One source called Johnson's musings, "blatant tampering," consistent with a pattern he has now developed of trying to rattle the cages of stars around the league long before they're theoretically available to be courted. From my understanding, the Sixers collectively took no issue with Simmons' initial request because they see his desire to connect with various great players as a good thing, a sign of his desire to continue improving. As Brand noted in his public quote, the Sixers feel great about their relationship with Simmons, agent Rich Paul, and Simmons' desire to continue playing for the Sixers on a long-term basis. Philadelphia also believes Brand's moves this season to build a title contender will strengthen the trust/belief their players have in the organization, viewing those not just as upgrades of the roster but statements of intent for their future. Whether Simmons is in Sixers colors until retirement will ultimately only be determined over time. Relationships or not, tampering or not, Simmons has been a mold breaker on and off the court. He's the 6-foot-10 point guard who doesn't shoot threes, and the kid who went to a non-glamour school for his only college season, filming a Showtime documentary about the experience all the while. For now, all the important parties feel good about how they gain from each other's company, short term and long term. With Philadelphia gearing up for a suddenly rugged Eastern Conference, they don't have much time to worry about anything beyond that.